While busy with a research assignment for the next few months, I am posting excerpts from my Judge family newsletter. Last week I introduced my great-grandfather, Brown Judge, who married my great-grandmother in Londonderry, Northern Ireland, in 1866. This week’s excerpt describes his life in Scotland, his family, and his decision to come to America in 1880. Although choosing to come to America must have been a major decision for Brown Judge and his wife Sarah Phillips, this was not the first time they had migrated. Brown and Sarah were both originally from the Ulster Province in the north of Ireland, and had married in Londonderry in the summer of 1866. Before the end of their first year of marriage, they had crossed the Firth of Clyde to Scotland, most likely by ferry, leaving Ireland to settle in the western county of Ayr. 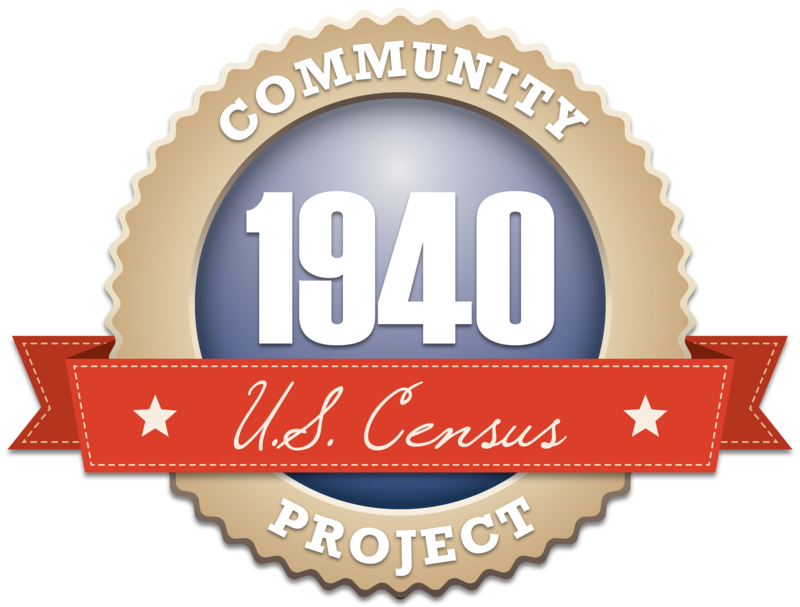 Whether Brown Judge’s ancestors were from England or Scotland originally, or native Irish, remains to be discovered. The 1871 census listed Brown and Sarah living on Glaisnock Street in the village of Old Cumnock with their two young daughters. Isabella, their first, was 4 years old and Mary Ann was 1; both were born in Cumnock. By the time the 1881 census was taken, Brown’s elderly mother Margaret was also in Scotland. She was living with her son John, his wife, and eight children! Margaret Brown Judge was 83 years old and a widow, but her husband’s date and place of death are unknown. Whether he came to Scotland with his wife or passed away earlier in Ireland is still a mystery. Margaret died in May 1881, a month after the census, and it is from her death certificate that we learn the former occupation of her deceased husband, James Judge: a flax dresser master who prepared flax fibers for spinning. When Brown and Sarah married, the marriage certificate listed Brown’s occupation as labourer, which at that time was the same occupation as his father’s. 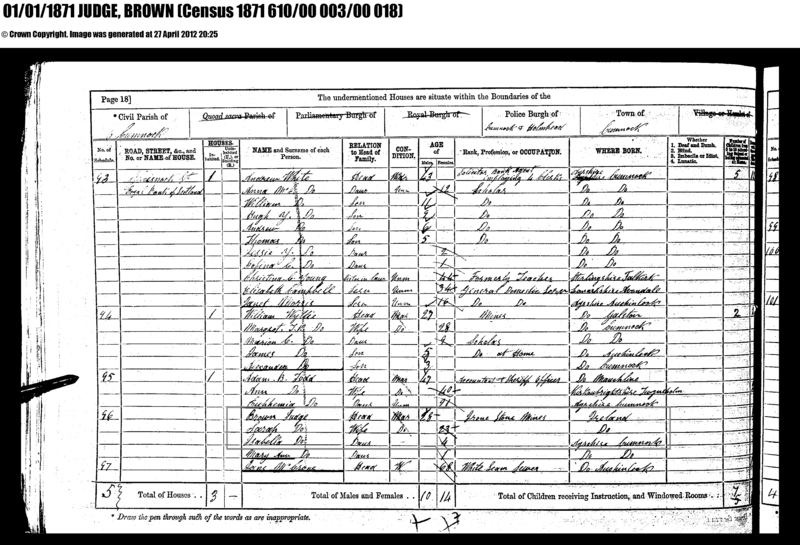 After moving to Scotland, according to the 1871 census, Brown Judge was working as an ironstone miner. The spread of mining for both coal and ironstone in Ayr brought many workers over from Ireland, which may have induced Brown to move to Scotland for work. His brother John had been living in Old Cumnock for at least 3 years before Brown and Sarah arrived, also working as an iron miner. While they may have had steady employment, working and living conditions were poor, with miners beholden to their employers for houses, and provisions that had to be bought at the company store. In mid-May of 1880, a little more than a year before his mother’s death, Brown Judge was on his way to New York from Glasgow by steamship. His reasons for leaving Scotland were probably labor-related, given that struggling miners in the nearby county of Lanarkshire agreed to strike that summer for the first time ever, for higher wages. Crossing the Atlantic Ocean would take between 10 and 11 days, with a stop at Moville, a port on the northern tip of Ireland, to pick up additional passengers. Like many emigrants who traveled ahead of their families, Brown left his wife and children behind. Many families had to wait for a father or husband to find work and send money to pay for the voyage of the rest of the family. A steerage fare would have cost about £4-5, the equivalent of about $300-400 today! Sarah and her children would have to wait a while longer before joining Brown in America.